The first record of Ptyas nigromarginata (Blyth, 1854) from Thailand and a new record from China are reported. 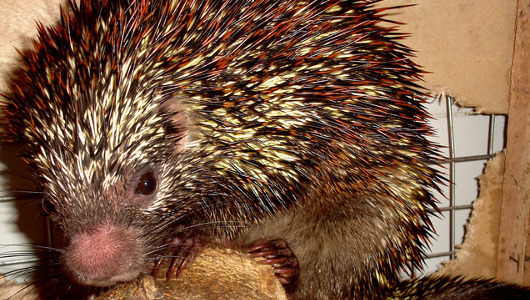 Literature and internet sources were searched for previous records of this species to establish its geographic and altitudinal distributions in Asia. The distribution in India was adapted to the new state division of the northern part of the country. The results show that the species almost exclusively occurs in hill evergreen and montane forests of the Himalayan foothills and mountain ranges continuous with it, at altitudes of 1000–2300 m above sea level. 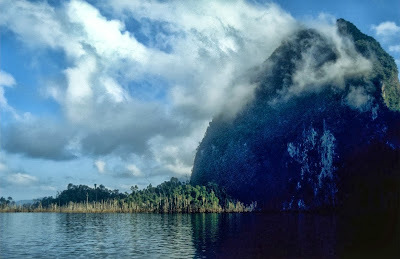 Forest islands in Chiew Larn Reservoir – such as the one in foreground of this photo – form a useful system to examine the ecological impacts of fragmentation. Surveys of these islands by Gibson and colleagues show that extinctions in forest fragments can occur much more rapidly than previously thought. Tropical forests continue to be felled and fragmented around the world. A key question is how rapidly species disappear from forest fragments and how quickly humans must restore forest connectivity to minimize extinctions. 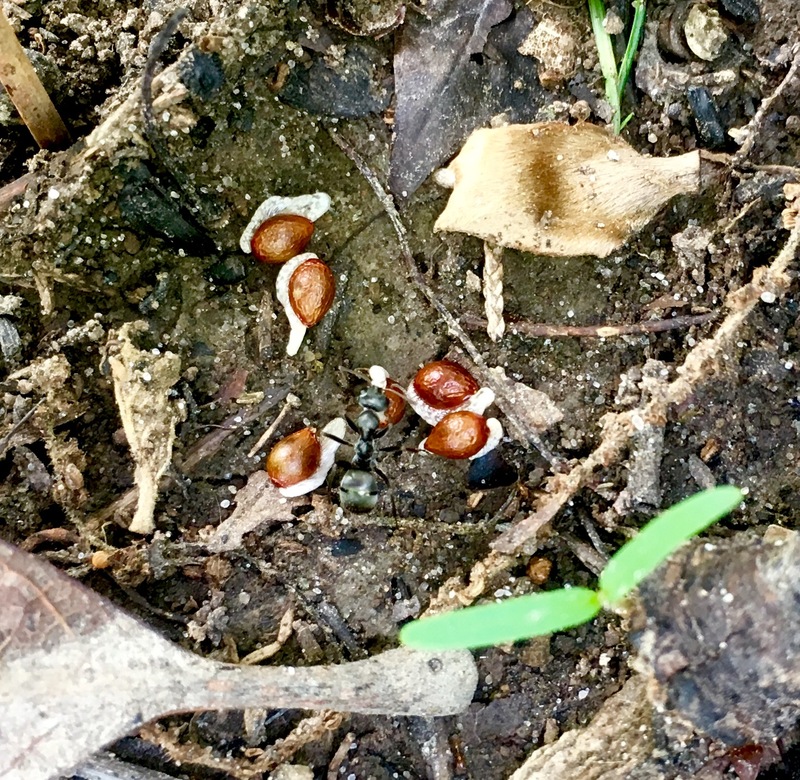 We surveyed small mammals on forest islands in Chiew Larn Reservoir in Thailand 5 to 7 and 25 to 26 years after isolation and observed the near-total loss of native small mammals within 5 years from <10-hectare (ha) fragments and within 25 years from 10- to 56-ha fragments. Based on our results, we developed an island biogeographic model and estimated mean extinction half-life (50% of resident species disappearing) to be 13.9 years. 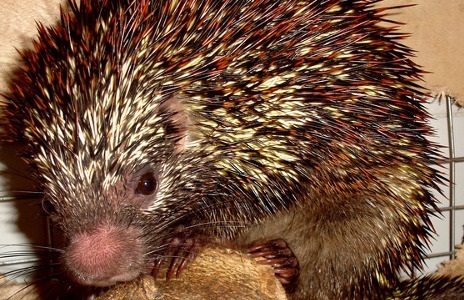 These catastrophic extinctions were probably partly driven by an invasive rat species; such biotic invasions are becoming increasingly common in human-modified landscapes. Our results are thus particularly relevant to other fragmented forest landscapes and suggest that small fragments are potentially even more vulnerable to biodiversity loss than previously thought. An international team of scientists including the University of Adelaide's Professor Corey Bradshaw has found that species living in rainforest fragments could be far more likely to disappear than was previously assumed. Published today in the leading journal Science, the researchers outlined a study spanning two decades in which they witnessed the near-complete extinction of native small mammals on forest islands created by a large hydroelectric reservoir in Thailand. "Tropical forests remain one of the last great bastions of biodiversity, but they continue to be felled and fragmented into small 'islands' around the world," says co-author Professor Corey Bradshaw, Director Ecological Modelling at the University of Adelaide's Environment Institute. "This study shows we need to be even more concerned than we thought – the speed at which there was near-total loss of native small mammals was alarming and shows that leaving fragments of forest behind is not nearly enough to protect these species." 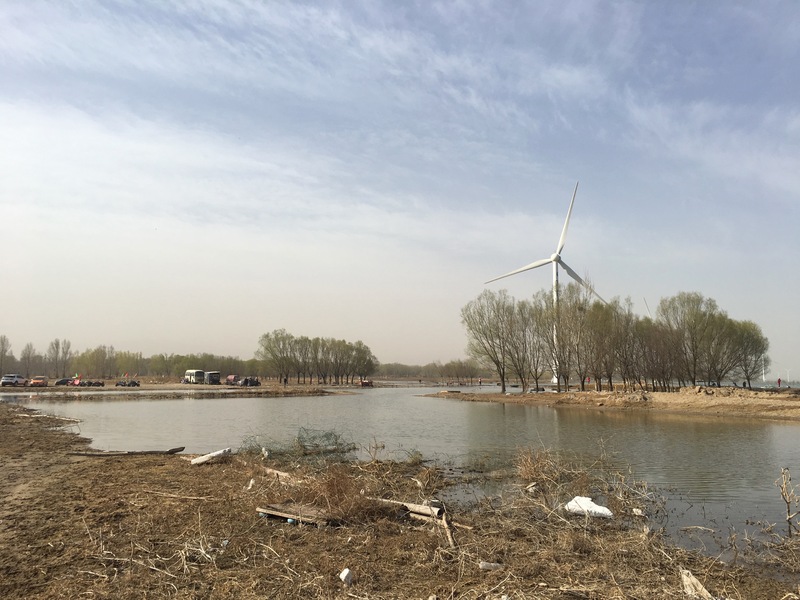 "It was like ecological Armageddon," says Luke Gibson from the National University of Singapore, who led the study. "Nobody imagined we'd see such catastrophic local extinctions." The study was motivated by a desire to understand how long species can live in forest fragments. 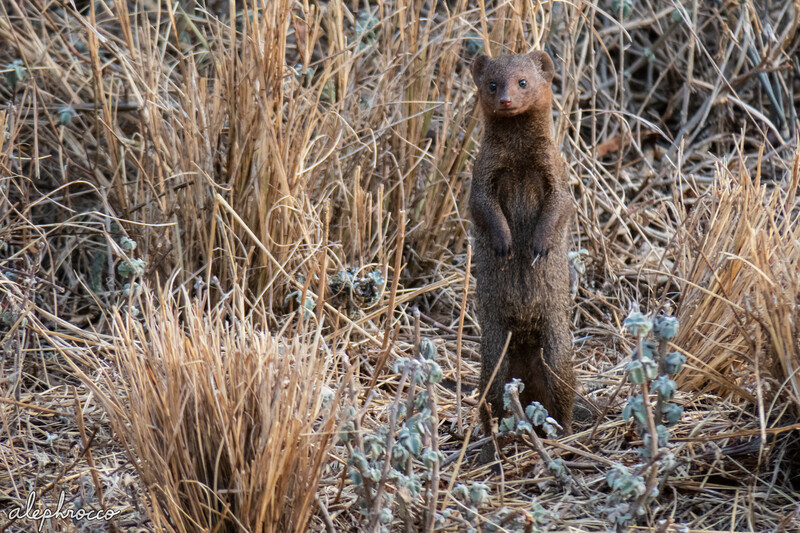 If they persist for many decades, then this gives conservationists a window of time to create wildlife corridors or restore surrounding forests to reduce the harmful effects of forest isolation. However, the researchers saw native small mammals almost vanish at great speed, with just a handful remaining – on average, less than one individual per island – after 25 years. 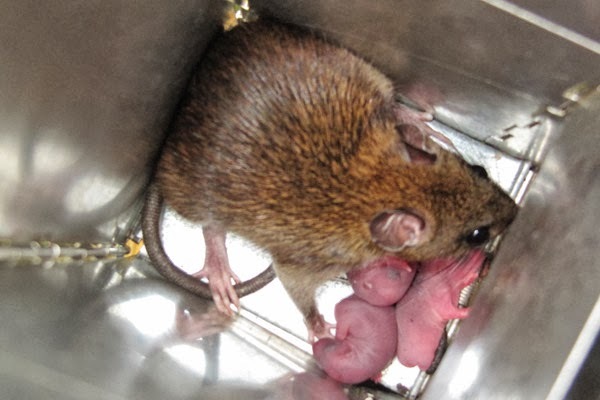 As well as suffering the effects of population isolation, the small mammals also had to deal with a devastating invader – the Malayan field rat. 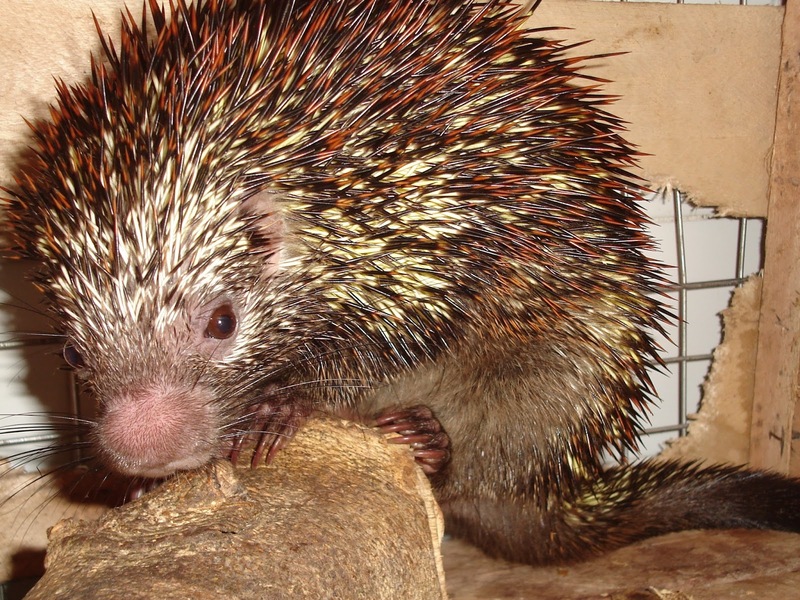 In just a few years, the invading rat virtually displaced all native small mammals. 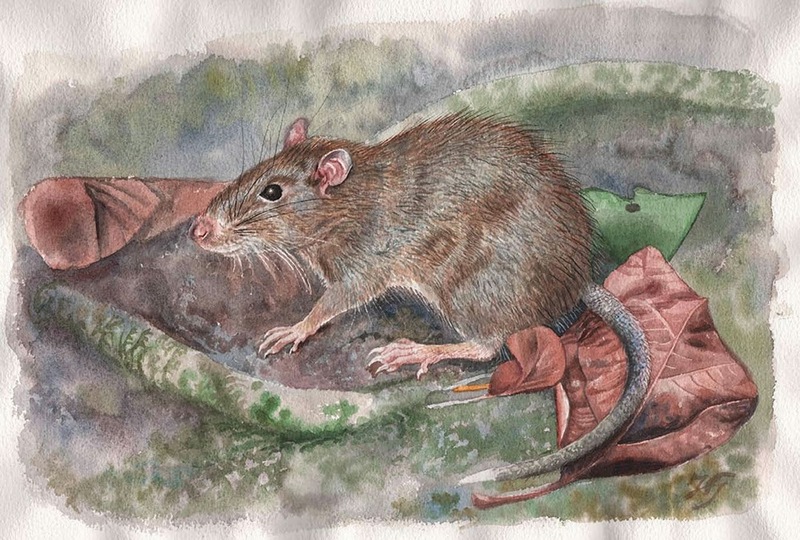 The field rat normally favours villages and agricultural lands, but will also invade disturbed forests. "This tells us that the double whammy of habitat fragmentation and invading species can be fatal for native wildlife," says Dr Antony Lynam, from the US-based Wildlife Conservation Society. "And that's frightening because invaders are increasing in disturbed and fragmented habitats around the world." "The bottom line is that we must conserve large, intact habitats for nature," says Luke Gibson. "That's the only way we can ensure biodiversity will survive." Luke Gibson, Antony J. Lynam, Corey J. A. Bradshaw, Fangliang He, David P. Bickford, David S. Woodruff, Sara Bumrungsri & William F. Laurance. 2013. Near-Complete Extinction of Native Small Mammal Fauna 25 Years After Forest Fragmentation. Science. 341 (6153): 1508-1510. A.J. Lynam and I. Billick. 1999. 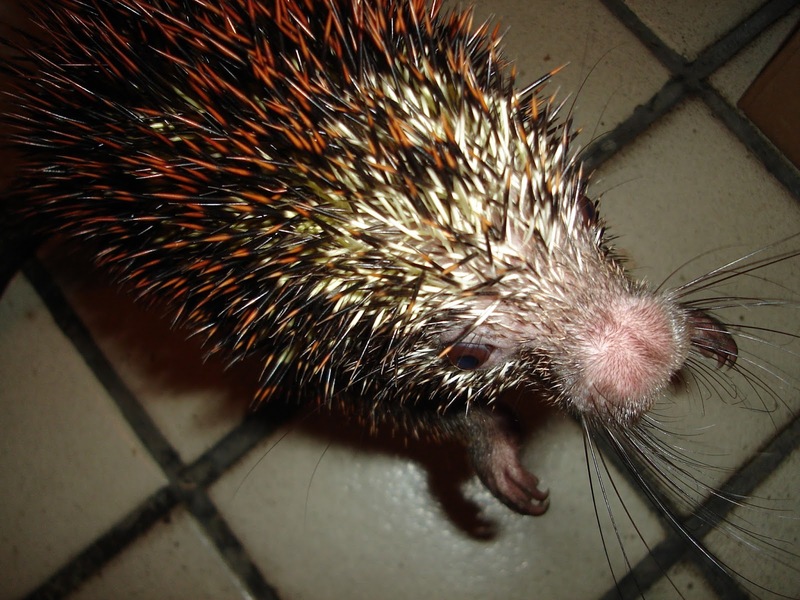 Differential responses of small mammals to fragmentation in a Thailand tropical forest. Biological Conservation. 91 (2–3): 191–200. We describe Halmaheramys bokimekot Fabre, Pagès, Musser, Fitriana, Semiadi & Helgen gen. et sp. nov., a new genus and species of murine rodent from the North Moluccas, and study its phylogenetic placement using both molecular and morphological data. We generated a densely sampled mitochondrial and nuclear DNA data set that included most genera of Indo-Pacific Murinae, and used probabilistic methodologies to infer their phylogenetic relationships. To reconstruct their biogeographical history, we first dated the topology and then used a Lagrange analysis to infer ancestral geographic areas. Finally, we combined the ancestral area reconstructions with temporal information to compare patterns of murine colonization among Indo-Pacific archipelagos. We provide a new and comprehensive molecular phylogenetic reconstruction for Indo-Pacific Murinae, with a focus on the Rattus division. Using previous results and those presented in this study, we define a new Indo-Pacific group within the Rattus division, composed of Bullimus, Bunomys, Paruromys, Halmaheramys, Sundamys, and Taeromys. Our phylogenetic reconstructions revealed a relatively recent diversification from the Middle Miocene to Plio-Pleistocene associated with several major dispersal events. We identified two independent Indo-Pacific dispersal events from both western and eastern Indo-Pacific archipelagos to the isolated island of Halmahera, which led to the speciations of H. bokimekot gen. et sp. nov. and Rattus morotaiensis Kellogg, 1945. We propose that a Middle Miocene collision between the Halmahera and Sangihe arcs may have been responsible for the arrival of the ancestor of Halmaheramys to eastern Wallacea. Halmaheramys bokimekot gen. et sp. nov. is described in detail, and its systematics and biogeography are documented and illustrated. Figure 1. Map of the Indo-Pacific Archipelago indicating contemporary islands, straits, seas, arcs, and faunal lines (modified from Lohman et al., 2011). Major islands are labelled; lineages of Murinae present on each island are also labelled; different countries in the Indo-Pacific are indicated by colours (see also Figs 2 and 3). 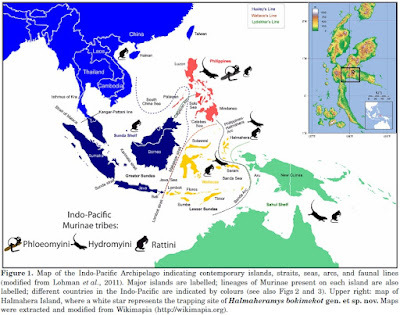 Upper right: map of Halmahera Island, where a white star represents the trapping site of Halmaheramys bokimekot gen. et sp. nov. Maps were extracted and modified from Wikimapia (http://wikimapia.org). Figure 7. Colour drawing of Halmaheramys bokimekot gen. et sp. nov.
Halmaheramys Fabre, Pagès, Musser, Fitriana, Semiadi & Helgen gen. nov. Type species: Halmaheramys bokimekot Fabre, Pagès, Musser, Fitriana, Semiadi & Helgen sp. nov.
Etymology: Halmaheramys is named after its geographical provenance in the North Moluccas, as so far it is the only known murine genus that is endemic to the island of Halmahera. We name the species after the type locality, Boki Mekot, situated in the northern part of Weda Bay, to the north of Sagea village (00°36′42.60″ N, 128°2′49.00″ E). This mountainous area is facing environmental threats from mining and logging operations. 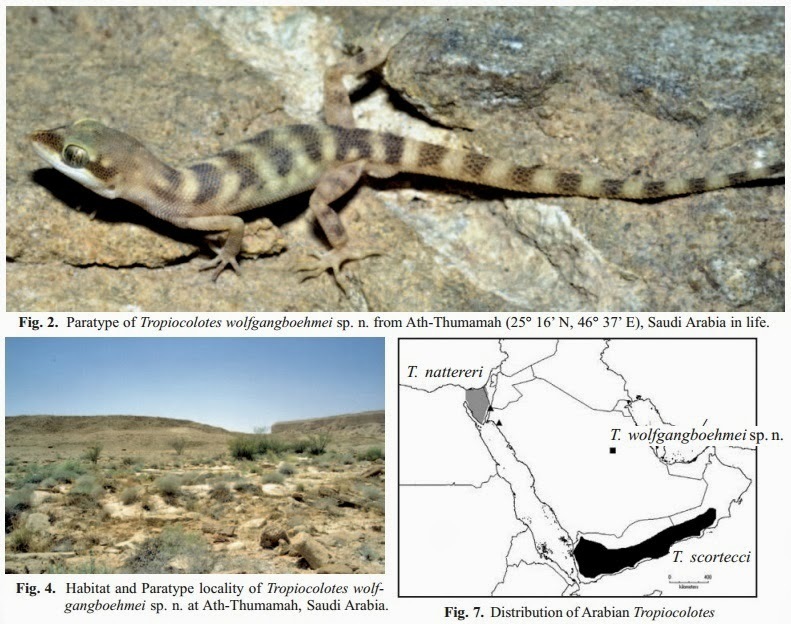 By naming the new species after the type locality, we highlight the importance of this limestone-rich area for conserving Halmaheran endemic biodiversity. Description: The genus is currently monotypic; see description for the species, below. Composition: The type species and only known member of Halmaheramys is H. bokimekot sp. 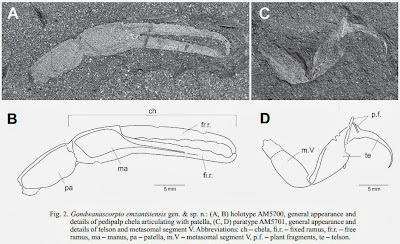 nov. Additional species of Halmaheramys are represented in the subfossil record of the island of Morotai, to the immediate north of Halmahera (K.P. Aplin and K.M. Helgen, unpubl. data). Natural history: In 2010, the mammalogical team of the MZB trapped six specimens of H. bokimekot gen. et sp. nov. in central Halmahera (Fig. 1), at a site located between 700 and 750 m a.s.l., in the southern part of Halmahera Island, north of Weda Bay. 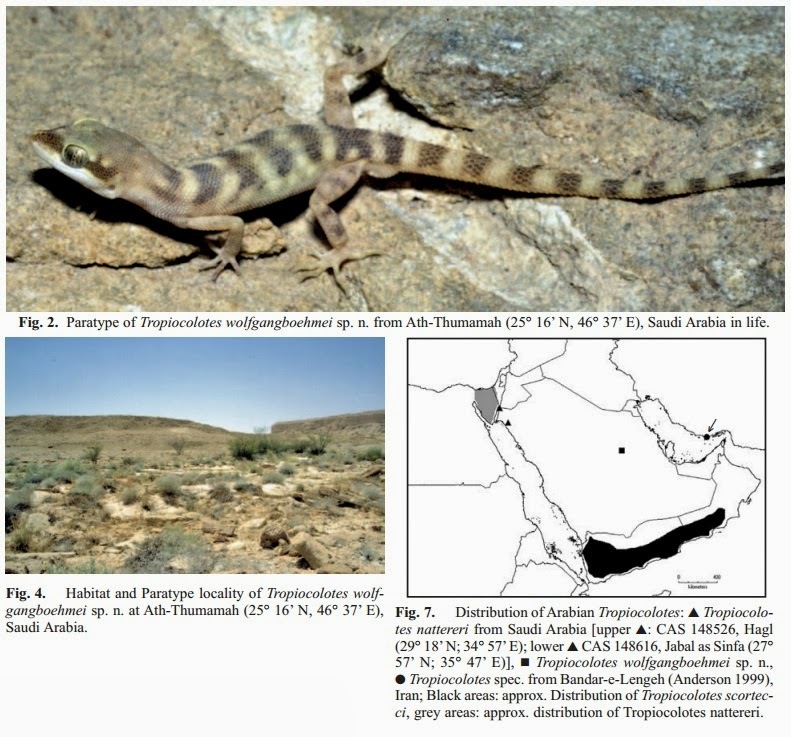 The type locality was situated at 723 m a.s.l. Boki Mekot is in a rugged hilly region, with dense primary lowland evergreen forest (Whitmore, 1987) and patches of open, old secondary growth (dominated by trees with small diameter trunks). No large rivers are within 15 km, but a small creek, with a gravel bed and slow, shallow water, remains active during the dry season. The soils have high nickel content, with thin humus (5–10 cm). The closest village is approximately 50 km from the trapping site. This is a mountainous area dominated by limestone and laterite. The surrounding highland rainforest is tall (≥ 30 m) and characterized by the following angiosperm families: Fagaceae (dominated by Lithocarpus species), Guttiferacea (nine species), Calophyllacea (dominated by Calophyllum species), Lauraceae (seven species dominated by Litsea species), and Myrtaceae (11 species dominated by Eugenia and Pometia species). Gymnosperms (Podocarpaceae), tree ferns, Ficus, rattans, bamboo, non-woody climbers, orchids, epiphytes, and bryophytes are also present (Sidiyasa & Tantra, 1984; Whitmore, 1987; Edwards et al., 1990; Flannery, 1995; Monk, Fretes & Reksodiharjo-Lilley, 1997). Specimens of H. bokimekot gen. et sp. nov. were captured in folding rat traps placed in runways beneath tree trunks lying on the ground, at burrow openings, and on tree trunks lying on or in subsurface spaces among tree roots. 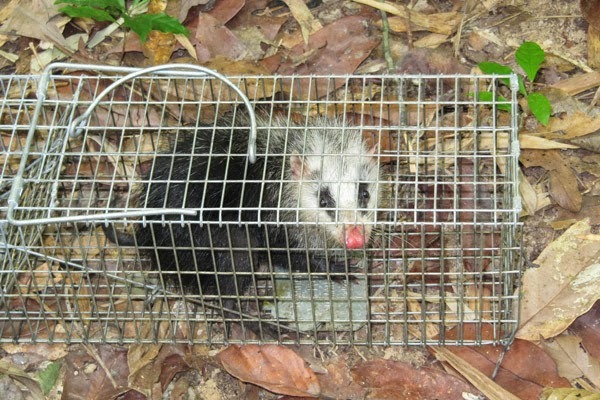 All specimens were trapped in primary forest. The bait consisted of roasted coconut and peanut butter. Halmaheramys bokimekot gen. et sp. nov. may be omnivorous, as stomach contents (n = 2) contained both vegetable and arthropod remains. Further study is needed in order to characterize the diet of Halmaheramys. 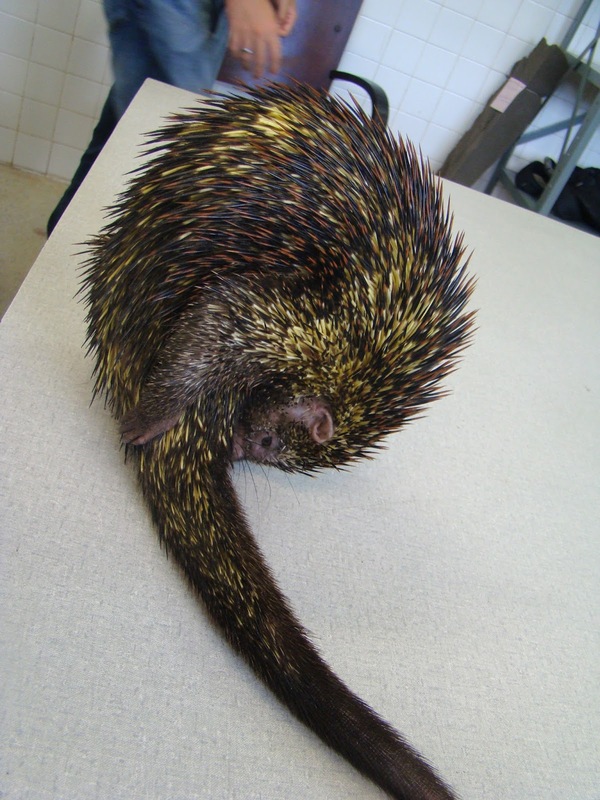 Specimens collected at the type locality, between 10 and 15 January 2010 included three adult males with scrotal testes, and three adult females, one with an inactive reproductive tract and two with active reproductive tracts (one was pregnant with three embryos). At the type locality, H. bokimekot gen. et sp. nov. was trapped in association with R. exulans, R. morotaiensis, Phalanger ornatus (Gray, 1860), Suncus murinus (Linnaeus, 1766), and Viverra tangalunga (Gray, 1832). Distribution: Known only from the type locality, Boki Mekot (Fig. 1). We predict that this rat will be found to be more widely distributed in appropriate forested habitats in Halmahera, and perhaps on adjacent islands with close Halmaheran biogeographic associations (e.g. Bacan, Morotai, Ternate, and Tidore). Vernacular names: We provide vernacular names for H. bokimekot gen. et sp. nov., both in English (Spiny Boki Mekot Rat) and in Bahasa Indonesia (Tikus Duri Boki Mekot). 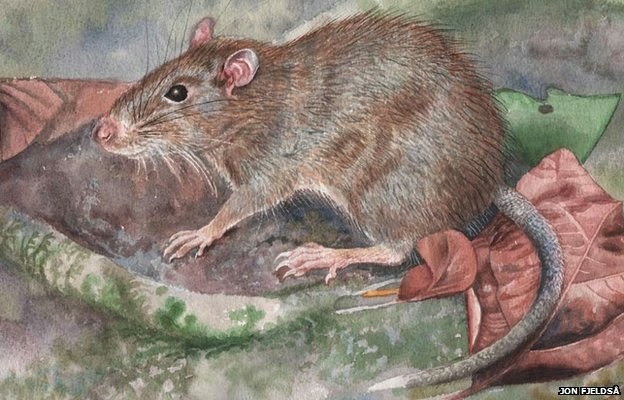 A team of scientists from Indonesia, Denmark, France and the United States has discovered a new species and genus of rodent on the Halmahera Island in the Moluccan province, Indonesia. ป้ายกำกับ: 'Open Access', 2013, Biogeography, Indonesia, Mammalogy, Moluccas, Muridae - Rat, New Genus, Rodentia, Systematics, Toponym, Wallacea, Zool. J. Linn. Soc. 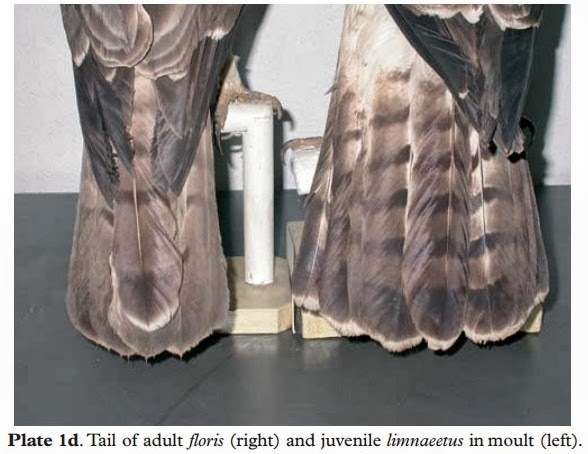 The Flores Hawk Eagle Nisaetus floris was first treated as a separate species by Gjershaug et al. 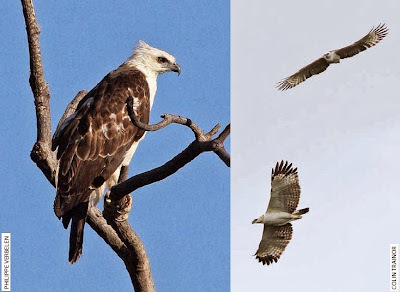 (2004) because it is morphologically distinct from Changeable Hawk Eagle N.cirrhatus; it was previously considered to be a subspecies of the latter. It is now an Indonesian endemic only known to occur on Flores, Sumbawa and Lombok as well as on two satellite islands, Satonda near Sumbawa and Rinca near Flores. Komodo was mentioned by Coates & Bishop (1997) as part of the range but no further details were provided. 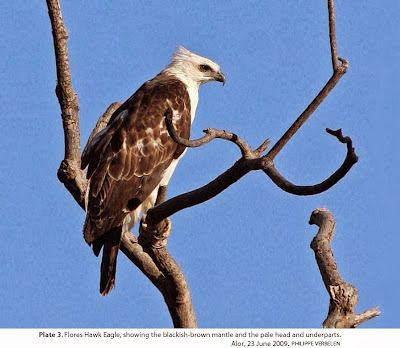 However further confirmation came in November 2011 when a bird was photographed on a tiny island just 800 m from Komodo, perched in mangroves, presumably examining a colony of fruit bats roosting there. Collaerts P, Collaerts E, Verbelen P, Trainor C.R. 2013. 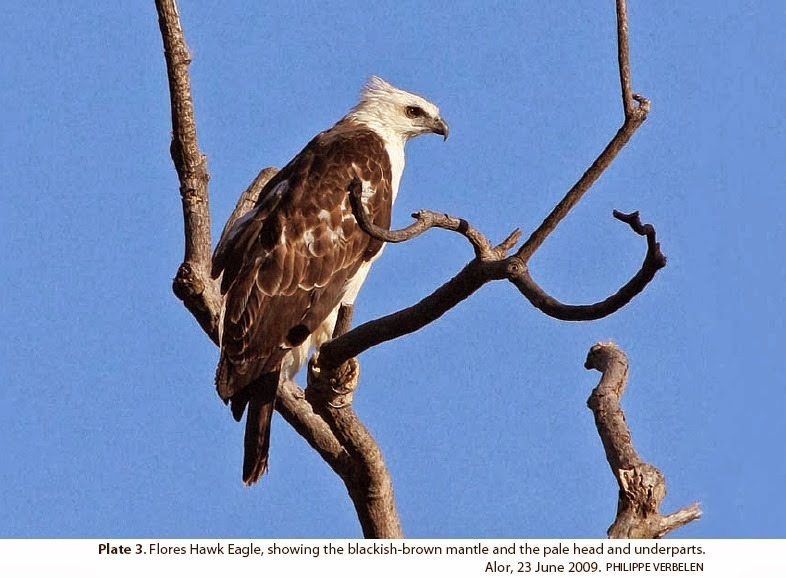 Discovery of the critically endangered Flores Hawk-Eagle Nisaetus floris on Alor island, Indonesia. BirdingASIA. 19:48-51. Morphological, vocal and molecular data have been used to reevaluate the taxonomy of some Asian Nisaetus taxa. This name is used instead of Spizaetus because the latter genus is polyphyletic with clades in Asia, South America and Africa. 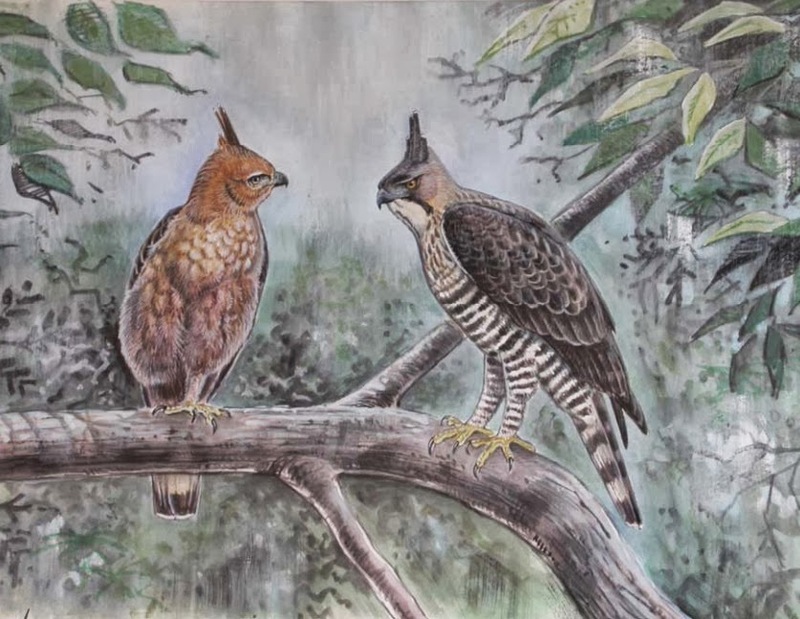 The Changeable Hawk-eagle complex (N. cirrhatus cirrhatus, N. c. limnaeetus, N. c. floris, N. lanceolatus and N. philippensis) has been studied. 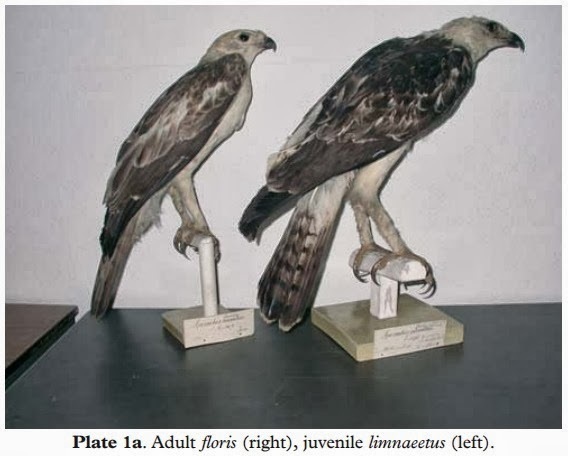 We propose that Nisaetus floris (Flores Hawk-eagle) should be treated as a distinct species, whereas the taxonomic status of Nisaetus c. cirrhatus and N. c. limnaeetus is still uncertain. We also propose that the Philippine Hawk-eagle should be split into two species Nisaetus philippensis and N. pinskeri. In the Mountain Hawk-eagle Nisaetus nipalensis complex, we propose that Nisaetus kelaarti (Legge’s Hawk-eagle) should be treated as a distinct species. The conservation status of Nisaetus floris, Nisaetus kelaarti and Nisaetus bartelsi has been evaluated from population density estimates, which are based on territory size. N. floris and N. bartelsi qualify for the category “Endangered” on the IUCN Red List, whereas N. kelaarti qualifies as “Near Threatened”. The changes in taxonomy of Nisaetus floris and N. kelaarti meet the qualification for being included in the Red List. Gjershaug, Jan Ove. 2006. 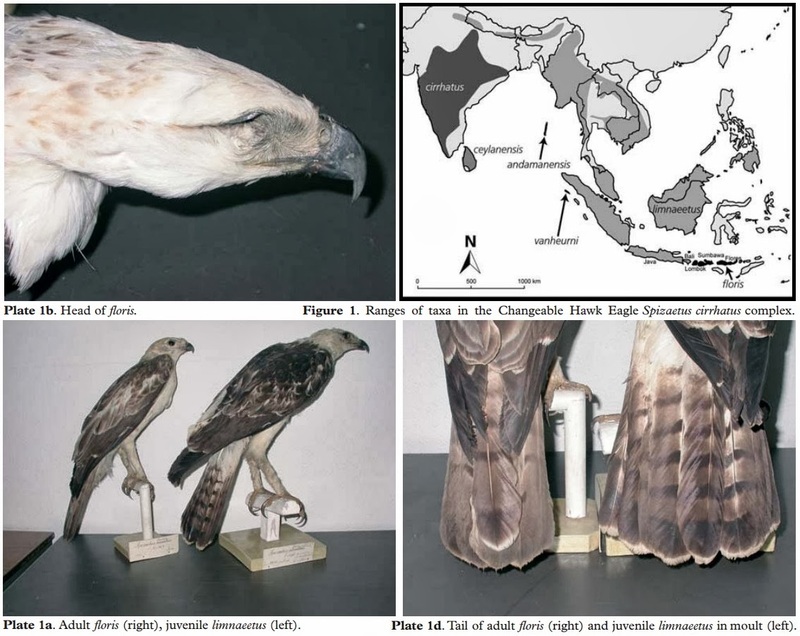 Taxonomy and Conservation status of Hawk-eagles (genus Nisaetus) in South-East Asia. Doctoral theses at NTNU (Norwegian University of Science and Technology). pp. 91. The Changeable Hawk Eagle Spizaetus cirrhatus complex ranges from India (cirrhatus) through South-East Asia (mainly limnaeetus) to Flores, Sumbawa and Lombok, Indonesia (floris). The latter taxon is morphologically very distinct from the widespread limnaeetus. It has diagnostic white patches on the upperside of the inner parts of the primaries, a juvenile-like adult plumage, and it is much larger than limnaeetus. It is allopatric with limnaeetus without any known geographical overlap. The large morphological differences indicate that the two taxa are reproductively isolated. We suggest that Spizaetus floris be treated as a distinct species with the English name of Flores Hawk Eagle. Figure 1. 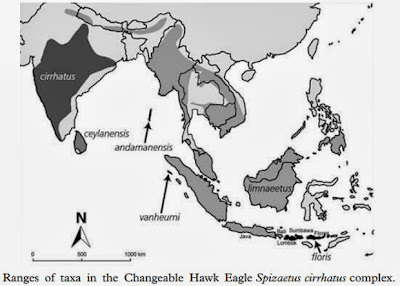 Ranges of taxa in the Changeable Hawk Eagle Spizaetus cirrhatus complex. Gjershaug, J. O., Kwaløy, K., Røv, N., Prawiradilaga, D. M., Suparman, U. & Rahman, Z. 2004. The Taxonomic Status of the Flores Hawk Eagle Spizaetus floris. Forktail. 20: 55–61. Fig. 2. Gondwanascorpio emzantsiensis gen. & sp. 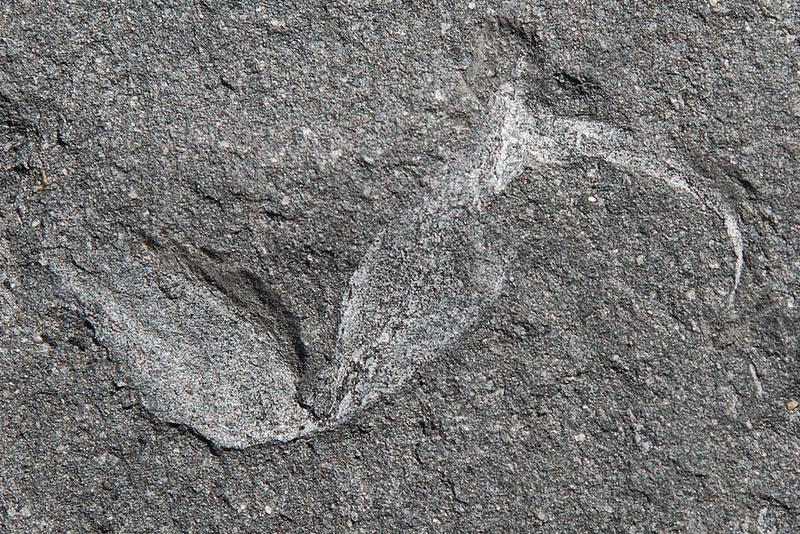 n.
Keywords: Scorpiones, Mesoscorpionina, Late Devonian, Famennian, Gondwana, South Africa, Waterloo Farm, chela, high palaeolatitude, new taxa, terrestrialisation. Etymology: From Gondwana and Latin scorpio (scorpion). Masculine gender. Gess, R.W. 2013. 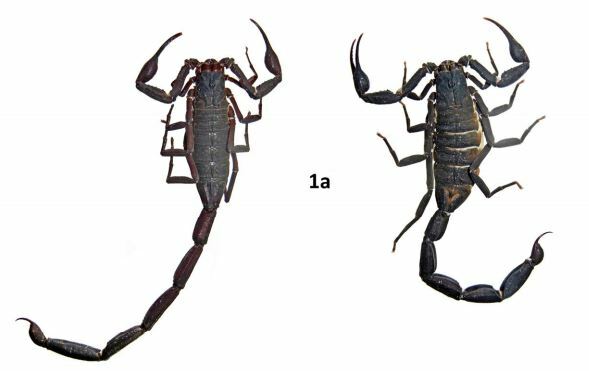 The Earliest Record of Terrestrial Animals in Gondwana: A Scorpion from the Famennian (Late Devonian) Witpoort Formation of South Africa. African Invertebrates. 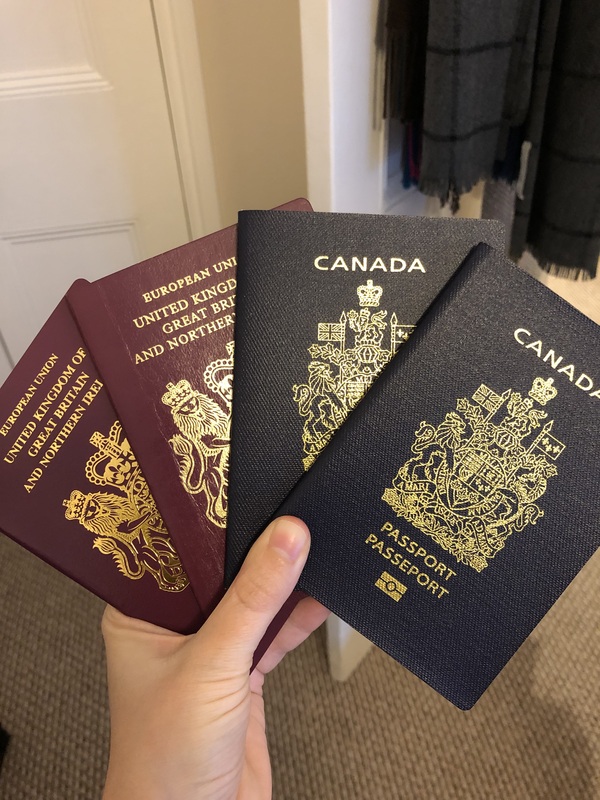 54 (2): 373–379. 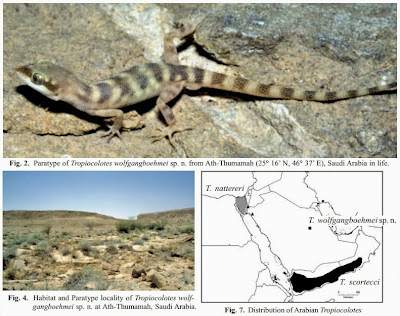 A new species of the genus Tropiocolotes from central Saudi Arabia is described based on two specimens from the Ath-Thumamah region. The new species is a member of the subgenus Tropiocolotes and belongs to the clade including T. steudneri and T. nattereri. Key words. Tropiocolotes sp. n., Ath-Thumama, Saudi Arabia. Derivatio nominis. This species is named after Prof. Dr.Wolfgang Böhme in honour to his contributions to herpetology during his 39 years as curator of herpetology at the Zoological Research Museum A. Koenig, Bonn and as the academic mentor of two of the authors of the present paper. Habitat. The holotype was found near a small village at the border of the Ath-Thumamah area (Kordges 1998). 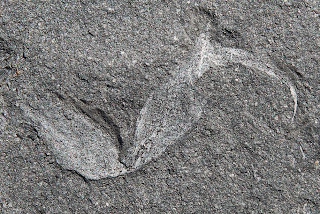 The paratype was found under a stone in a small canyon within the Buwayb-Escarpment which is a cretaceous coral reef consisting of sedimentary rock, mainly lime- and sandstone. Figure 3. Four new species of Anniella and their diagnostic characters. Upper left, Anniella alexanderae: dorsal (MVZ 250549, paratype); ventral view showing the diagnostic gray coloration (MVZ 257720, paratype). Upper right, Anniella campi: dorsal (MCZ-R-189380, paratype); detail (MVZ 257277, holotype) showing diagnostic double dark lateral stripes. Lower left, Anniella grinnelli: ventral (MVZ 247487, paratype) showing diagnostic purple coloration; dorsal (MVZ 267228, paratype). Lower right, Anniella stebbinsi: dorsal (MVZ 250558, paratype); ventral (MVZ 267248). Center: comparison of ventral coloration from three of the new species. 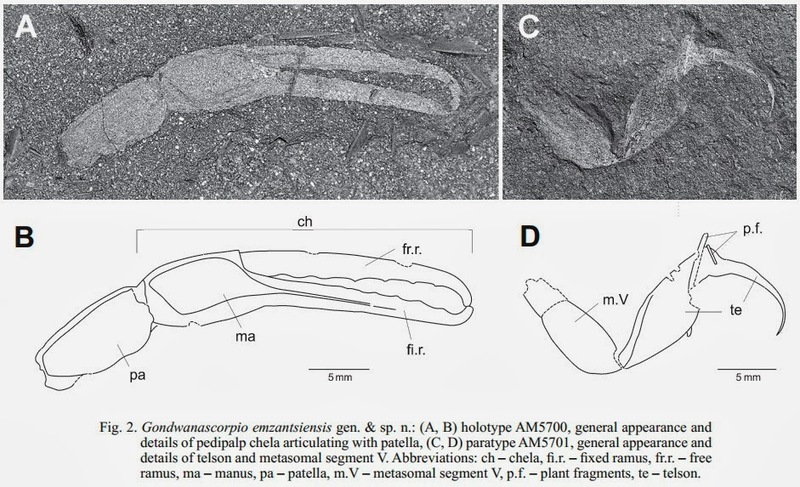 Left, A. grinnelli (MVZ 250546, paratype); center, A. alexanderae (MVZ 250549, paratype); right, A. stebbinsi (MVZ 250558, paratype). 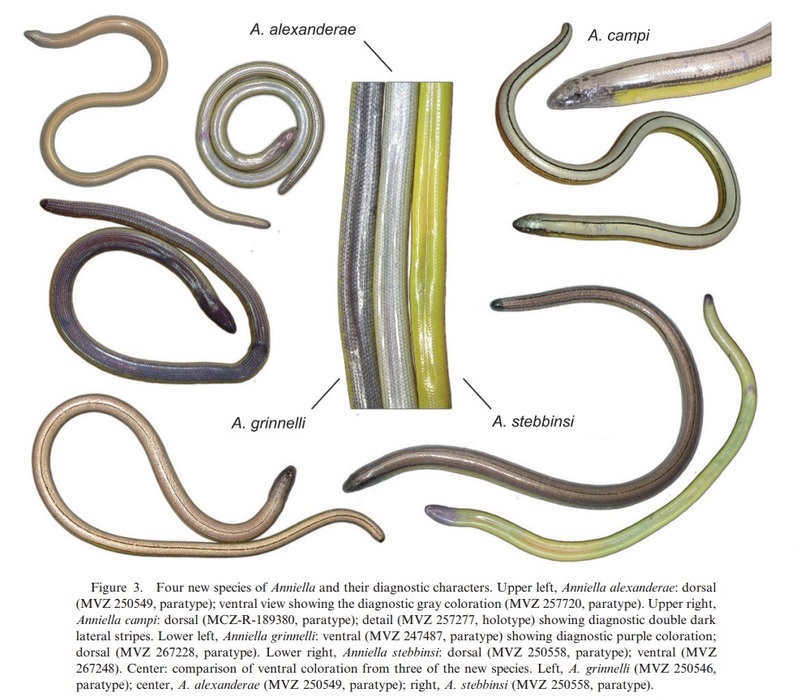 A previous genetic study of the California legless lizard (Anniella pulchra) revealed five deep genetic lineages and alluded to morphological differences among them. Here we show that three of these genetic lineages can be readily diagnosed from topotypic A. pulchra through a combination of coloration, scalation, and skeletal characters (trunk vertebra number). A fourth lineage is cryptic, but can be diagnosed from A. pulchra by its karyotype. We argue that these genetic clades of A. pulchra are strong candidates for species recognition because they exhibit properties that corroborate the DNA evidence for lineage separation. We therefore hypothesize that each of the five genetic clades of A. pulchra (‘‘Anniella clades A–E’’) are distinct species and so describe four new species (Anniella alexanderae, sp. nov., Anniella campi, sp. nov., Anniella grinnelli, sp. nov., and Anniella stebbinsi, sp. nov.). In naming these new species we have chosen to honor four natural historians whose contributions to the study of California’s vertebrate biodiversity are an ongoing inspiration for students of natural history and natural history museum curators. Two of these new species have small and poorly characterized ranges in the San Joaquin Valley and Carrizo Plain (A. alexanderae and A. grinnelli). A third restricted-range species (A. campi) is known from just three sites in the eastern Sierra Nevada. The fourth new species (A. stebbinsi) is a wide-ranging cryptic lineage that occurs throughout Southern California and into Baja California, Mexico. The limited distribution and fragile habitats occupied by the new species of Anniella warrant additional scientific research and conservation attention. Figure 4. Type localities of the four new species of Anniella. 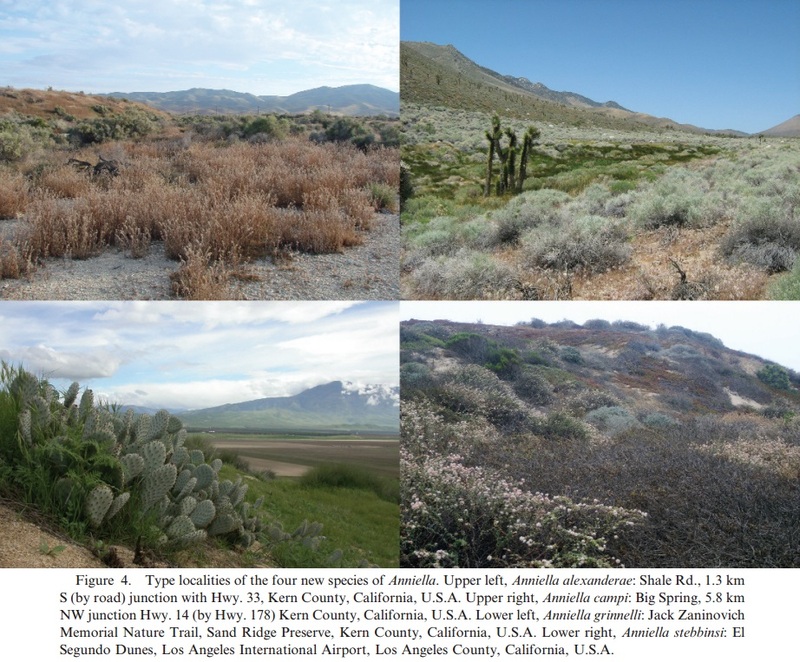 Upper left, Anniella alexanderae: Kern County, California, U.S.A. Upper right, Anniella campi: Kern County, California, U.S.A. Lower left, Anniella grinnelli: Jack Zaninovich Memorial Nature Trail, Sand Ridge Preserve, Kern County, California, U.S.A. Lower right, Anniella stebbinsi: El Segundo Dunes, Los Angeles International Airport, Los Angeles County, California, U.S.A.
have conspicuously brownish red tips that contrast with the blackish dorsal background color. The new species is overall similar to C. nycthemera, but the dorsal body quills are typically tricolored in the former and bicolored in the latter. 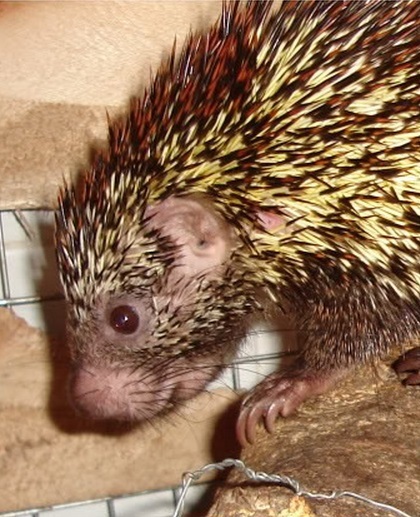 The new species is externally very distinct from C. insidiosus, especially because the latter has bicolored dorsal quills that are almost completely hidden beneath longer and homogeneous pale or dark hairs. Sierra Madre Ground-Warbler Robsonius thompsoni (upper) was discovered after two years of elusive expeditions in Northern Luzon, the Philippines. The 10-cm-tall bird had earlier been confused for its close cousin, Cordilleran Ground-Warbler Robsonius rabori (lower). 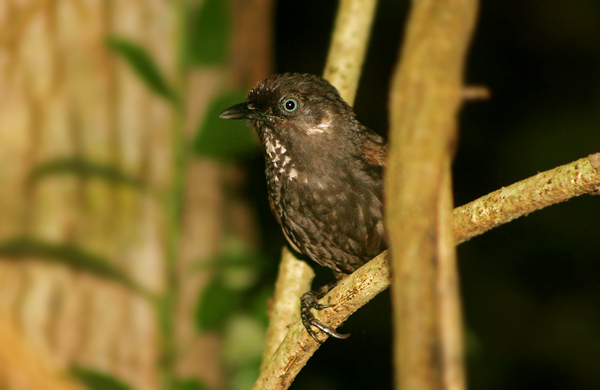 The Robsonius ground-warblers are forest birds endemic to the Luzon Island complex in the Philippine archipelago. Their systematic relationships have long remained ambiguous; until recently they were included in the timaliid genus Napothera. Two Robsonius species are currently recognized on the basis of plumage differences: R. rabori from northern Luzon in the Cordillera Central and the northern Sierra Madre, and R. sorsogonensis from southern Luzon and Catanduanes Island. Recent specimen collections, including the first adult specimen from the Cordillera Central, establish plumage differences between populations of R. rabori in the Cordillera Central and Sierra Madre and reveal a third diagnosable population within Luzon. These differences have gone unnoticed because R. rabori (sensu stricto) had been known only from the juvenile holotype. Molecular phylogenetic data further support the hypothesis that three highly divergent taxa occur across the Luzon Island complex: Robsonius rabori is known only from the northern Cordillera Central in Ilocos Norte; an undescribed taxon (formerly included in R. rabori) occurs in the northern Sierra Madre in Cagayan, Isabela, Aurora, and Nueva Vizcaya provinces; and R. sorsogonensis occurs in southern Luzon (Bulacan and Laguna provinces), the Bicol Peninsula, and on Catanduanes Island. The existence of three putatively allopatric species within the Luzon island complex highlights the role of in situ diversification in island systems, and brings attention to the need for forest conservation to protect geographically restricted populations throughout the Luzon Island complex. — Birds are subjects of great interest to many people. They are often easy-to-spot, charismatic and beautiful. Because of this interest, birds tend to be well-studied, and most years see only a handful of new bird species discovered and described in scientific journals. However, this past year has seen 23 new birds described so far. Remarkably, three of those new birds have been introduced to science by researchers at the University of Kansas’ Biodiversity Institute. And a KU graduate student in ecology and evolutionary biology, Pete Hosner, has co-authored two of those. 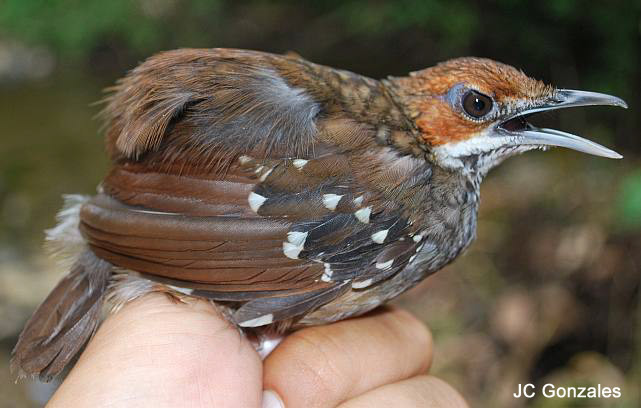 The KU researcher’s most recent find is dubbed the Sierra Madre Ground-Warbler, a ground-dwelling forest bird that lives on Luzon Island of the Philippine archipelago. Its description is published in the August issue of The Condor, a scientific journal of the Cooper Ornithological Society. 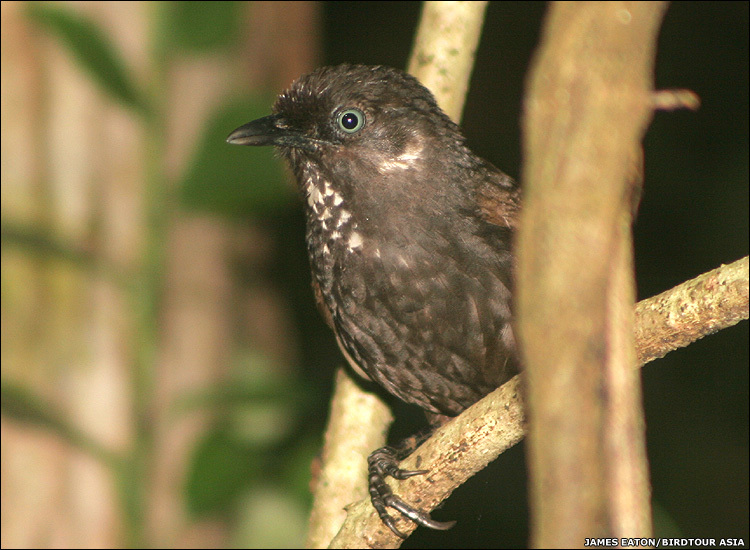 Hosner said the new species of ground-warbler looks similar to the other two species of ground-warblers in the Philippines, so it wasn’t recognized as an independent species at first. Examination of its DNA was key to differentiating the new ground-warbler once it was spotted in the field. The DNA sequence data was collected in KU Biodiversity Institute’s Molecular Phylogenetics Laboratory, which was recently renovated with investment from the National Science Foundation, the state of Kansas and KU. “When we noted the different plumage coloration between adult birds in the Cordillera and the Sierra Madre in northern Luzon, we sequenced DNA to determine if the plumage differences were individual variation within a species, or if the two plumage forms were also genetically diagnosable,” Hosner said. “We found that Cordillera and Sierra Madre birds were highly divergent in their DNA, almost as different as the distinctive Bicol Ground-Warbler in southern Luzon." The new bird species’ scientific name honors Max Thompson, a retired professor from Southwestern College in Winfield and a research associate in the KU Biodiversity Institute. Hosner’s co-authors are Nikki C. Boggess, Carl H. Oliveros and Robert G. Moyle from KU’s Biodiversity Institute and Department of Ecology and Evolutionary Biology; Luis Sanchez-Gonzalez from KU’s Biodiversity Institute and the Universidad Nacional Autónoma de Mexico; Phillip Alviola from the University of the Philippines Los Baños; and Rolly Urriza from the Philippine National Museum. captured two individuals. 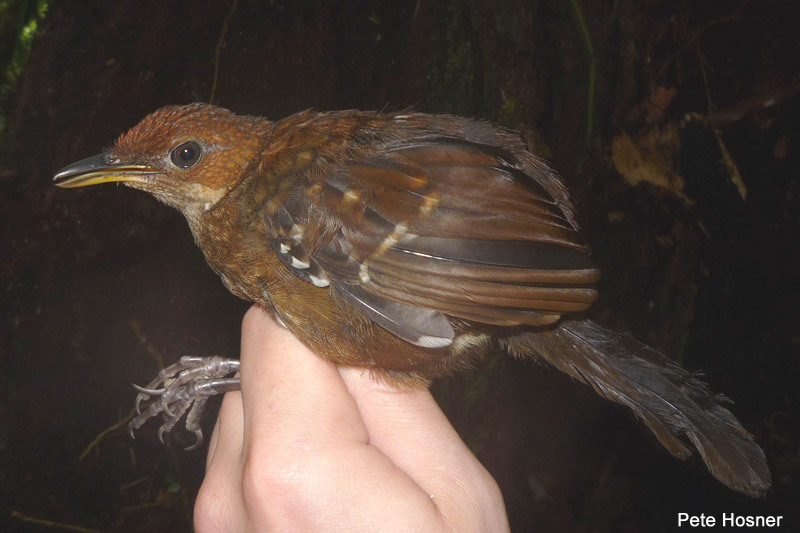 Subsequent investigation showed that the specimens belonged to a previously undescribed species, which we designate Stachyris nonggangensis, the Nonggang Babbler. Etymology.— We name this species in reference to the collection site, Nonggang Natural Reserve, which is located in south Guangxi (22°13′–22°34′N, 106°42′–107°05′E) and covers an area of 101 sq.km., 18 km southeast of the Vietnamese border. The reserve was named after Nonggang, a small village located in a limestone region 2 km from the collection site. Habitat and behavior.— The principal habitat for the species is the karst seasonal rainforest. After selective cutting, the dominant tree species in this rainforest is Excentrodendron hsienmu (Forestry Department of Guangxi Province 1993). 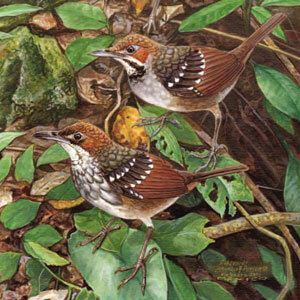 The Nonggang Babblers were often seen walking on rocks and were seldom seen in trees or flying. The birds flew only short distances, and only when frightened. The behavior of S. nonggangensis is similar to that of wren babblers (Napothera spp. ), with which it co-occurs in this area. Nonggang Babblers often forage in the gaps between two rocks by turning over the fallen leaves, apparently preying on insects and other arthropods. Sometimes they foraged on the small mounds that appeared after the trees were logged. 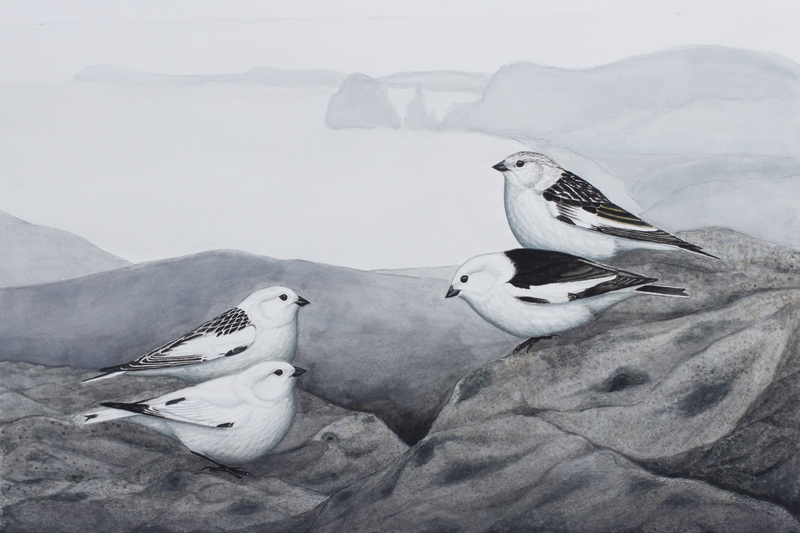 They were seen only in single-species flocks in winter. They occurred in flocks of 5–10 individuals in the nonbreeding period but were often seen in pairs during the breeding period. Grey-throated Babblers (Stachyris nigriceps) and Spot-necked Babblers (S. striolata) were captured several times in the area where we found Nonggang Babblers. 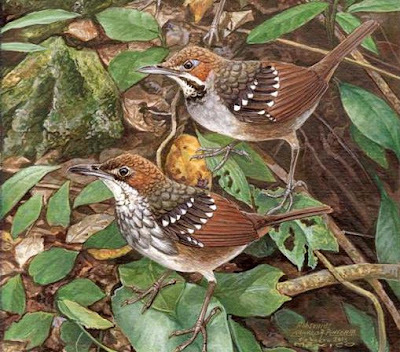 Unlike the Nonggang Babbler, these two species mainly inhabit the undergrowth, searching for food among leaves and twigs and seldom coming down to the ground. Distribution and status.— The known distribution of S. nonggangensis is limited to the Nonggang Natural Reserve. Despite extensive observational and netting surveys in heavily degraded to pristine forest in the non-limestone mountains of the Sino-Vietnamese border areas of south Guangxi since 2004, we have not encountered the species there. However, we often observed it in the limestone area of Nonggang Natural Reserve. Because of the species’ specialized habitat requirements, we presume that its distribution is limited to the limestone region and the well-protected vegetation of the Sino-Vietnamese border area, including southwest Guangxi of China and the limestone region of the northern highlands of Vietnam. Similar habitats may extend westward into adjacent southeast Yunnan Province. Zhou, Fang and Jiang Aiwu. 2008. A New Species of Babbler (Timaliidae: Stachyris) from the Sino-Vietnamese Border Region of China. The Auk. 125(2): 420–424. (D) Phnom Prich Wildlife Sanctuary, Mondulkiri Province, Cambodia (Photo by Channa Phan). Distribution.— The new species is known to occur at five localities from southern Vietnam through eastern Cambodia to central Laos. 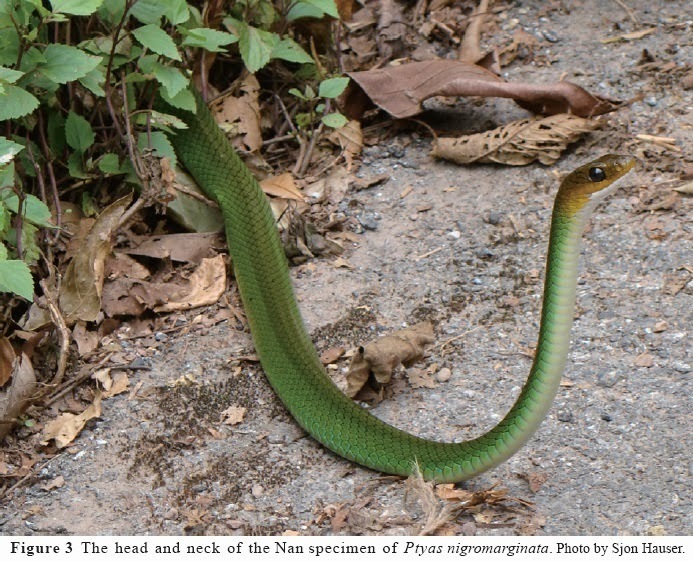 The record from Cambodia is based on a photograph of an individual from Phnom Prich Wildlife Sanctuary, Mondulkiri Province, Cambodia (Fig. 3D). Etymology.— The specific epithet refers to the new species’ distribution in Indochina, a geographic area containing the modern-day countries of Vietnam, Laos, and Cambodia. The known distribution of K. indochinensis is restricted to eastern Indochina. Other cooccurring congeners in this region include K. mediolineata from Dac Lac Province, Vietnam (Nguyen et al., 2009), K. aureata from southern Peninsular Thailand (Nutphund, 2001), and K. pulchra, which is ubiquitous throughout disturbed habitats in Asia (Frost, 2011). Based on geographic proximity, it is possible that K. indochinensis occurs in sympatry with K. pulchra and K. mediolineata. A new species of narrow-mouthed frog of Kaloula is described in the Nonggang National Nature Reserve, Sino-Vietnamese border region of southern China. Kaloula nonggangensis sp. nov. is distinguished from its congeners by a combination of the following characters: medium size (SVL 41.4–52.7 mm in 18 adult males, 52.2 mm in 1 female); smooth or slightly rough olive dorsum with irregular dark-green marks and brown spots; tips of the fingers widely dilated and truncated; males with nearly fully webbed toes; males with two side protuberant osseous tubercles on the upper surface of the tips of fingers and chest beige with small lemon-colored spots. K. nonggangensis sp. nov. is found in habitats ranging from cultivated fields adjacent to the forest to primary evergreen forest in karst habitats. Based upon a 16S ribosomal RNA mitochondrial gene fragment, K. nonggangensis sp. nov. is embedded within the K. verrucosa group (including K. borealis, K. rugifera and K. verrucosa), and displays a low genetic distance to these species (< 3%). Considering the distinct morphology and karyotype we nevertheless suggest a status as separate species for these allopatrically distributed lineages. Mo, Yun-Ming, Wei Zhang, Shichu Zhou, Tianbo Chen, Huaxing Tang, Yuanjun Meng & Weicai Chen. 2013. A new species of Kaloula (Amphibia: Anura: Microhylidae) from southern Guangxi, China. Zootaxa. 3710(2): 165–178. We describe a new species of narrow-mouthed frog of the genus Kaloula from the volcanic mountains of southern Luzon Island (Mt. Banahao, Mt. Isarog, and Mt. Mayon) and adjacent Polillo Island, Philippines. On the volcanoes of southern Luzon, the new species is found in habitats ranging from small dry stream beds to stationary pools of rivers in mid- to upper montane primary forest. 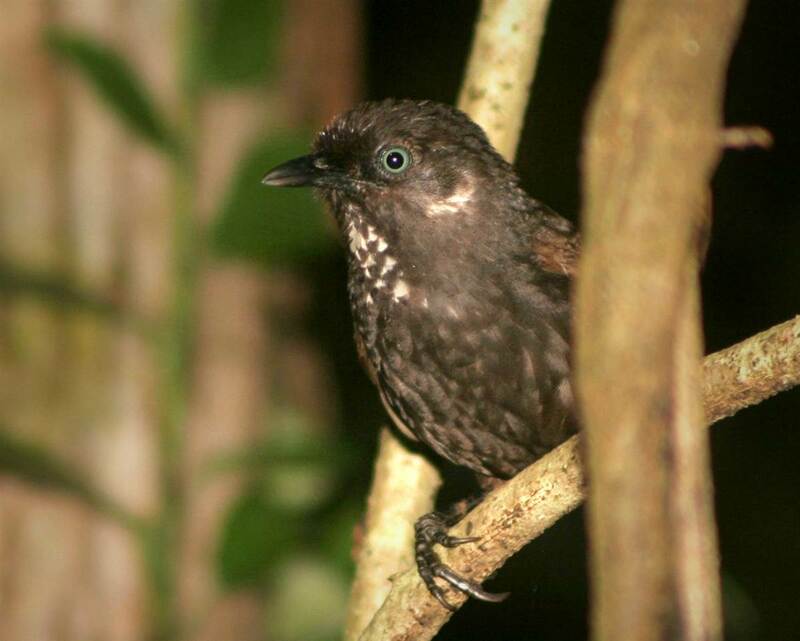 On Polillo Island, the new species has been found near quiet streams in selectively logged primary forest and second growth near sea level. The new species presumably is allied to Kaloula rigida (a forest species endemic to northern Luzon Island) and to Kaloula picta (a more widespread Philippine endemic that is found in a variety of habitats) as indicated by possession of narrow disks on the digits and by the presence of supernumerary tubercles on the palmar surface of the manus. It differs from these species by its smaller body size, reduction of webbing on toes, absence or extreme reduction of outer metacarpal tubercles, and by characteristics of the advertisement call. Other sympatric species of anurans include K conjuncta conjuncta, Limnonectes macrocephalus, Limnonectes woodworthi, Rana luzonensis, Rana similis, Philautus surdus, Platymantis banahao, Platymantis corrugatus, Platymantis dorsalis, Platymantis luzonensis, Platymantis montanus, Platymantis indeprensus, and Platymantis pseudodorsalis. Other amphibians known from Mt. 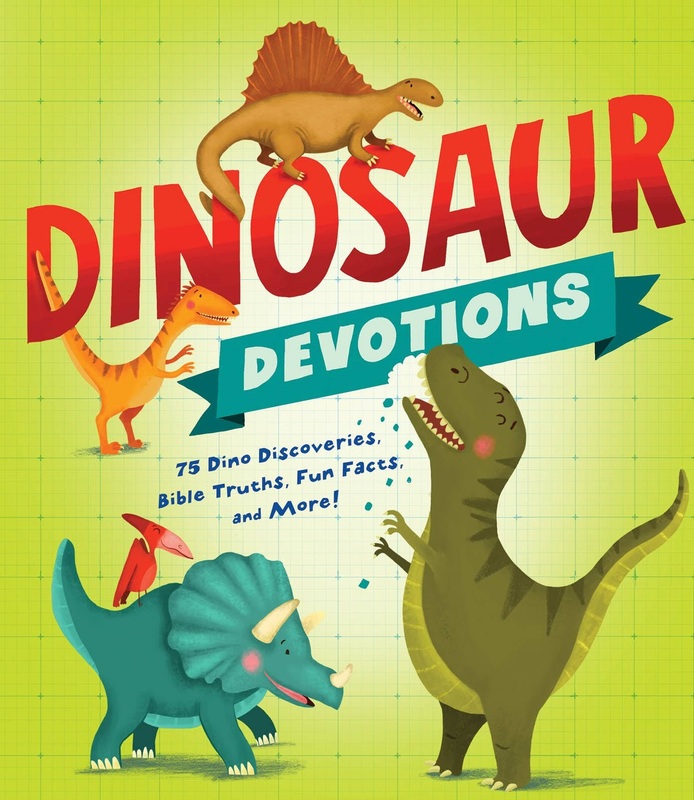 Banahao (Diesmos, 1998; unpubl. data), that we have not found at the specific type locality, include Occidozyga laevis, Rana erythraea, Polypedates leucomystax, Rhacophorus bimaculatus, Rhacophorus pardalis, and two additional undescribed species of Platymantis. On Mt. Isarog, the new species also is sympatric with Platymantis isarog (Brown et al., 1997), and an undescribed species of Platymantis (unpubl. data) and on Polillo Island, Rhacophorus appendiculatus, Platymantis polillensis, Platymantis sp. 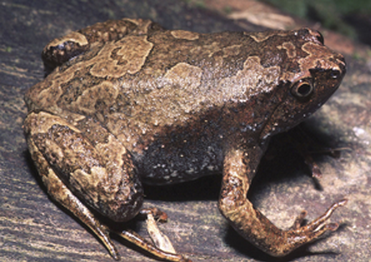 (of uncertain taxonomic status, possibly conspecific with P. luzonensis) and Rana (= Fejervarya) vittigera also have been recorded sympatrically (Hampson, 1999a,b; ACD and RMB, pers. obs. ).